This event ran in 2018 but we don't yet have this year's details. When we get them, we'll add them, but in the meantime we include below event information from last year to remind you about the event. A wide selection of diverse gardens plus the new improved Art Trail. Over 20 artists will be exhibiting and selling their wares in the gardens: sculpture, jewellery, paintings, fine art, textiles, ceramics and photography. Plus two friendly village pubs and a fine restaurant. The event proceeds support a variety of charities. There will be a plant stall. Adults £4.00 covers both days, accompanied children free. Entry stickers can be bought from the church, participating gardens, or badged helpers. Programme booklet provided - one per group/family/couple. Please display your sticker so that we know you've contributed to our good causes. Thankyou! In 2018 the organisers of this event made a donation towards the upkeep of this website. Make a small donation to help to keep this website alive. 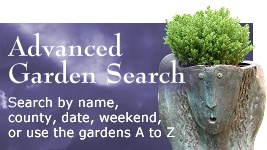 See which Open Gardens have been added recently. 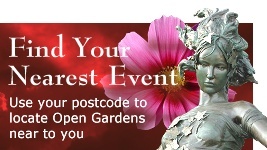 How many Open Gardens events are on this website? How many cryptic plant clues can you solve? 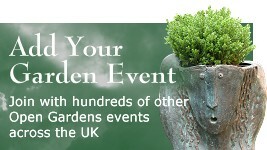 How are open gardens events spread through the year?